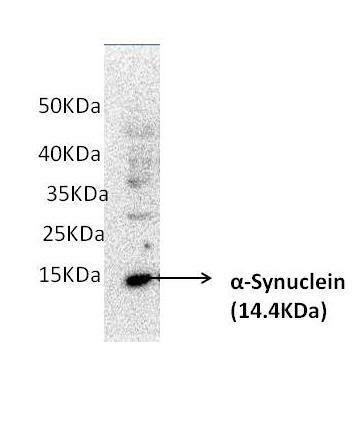 This antibody recognizes human alpha-synuclein. Clone LB 509 recognizes amino acids 115-122 of alpha-synuclein and has been reported to be specific to human alpha-synuclein (Jakes et al., Neurosci Lett., 1999). 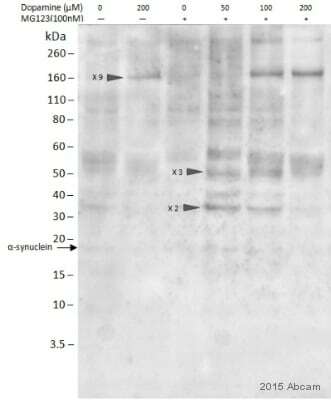 Therefore, we only guarantee this antibody to detect human alpha-synuclein. However, several customer Abreviews have demonstrated positive staining in rodent samples. Ab27766 reacts with an epitope located in the region encoded by amino acids 115-122 of alpha-synuclein. WB: full-length, recombinant alpha-synuclein protein. Our Abpromise guarantee covers the use of ab27766 in the following tested applications. WB 1/100 - 1/1000. Predicted molecular weight: 14 kDa. IHC-P 1/100 - 1/1000. Do not perform antigen retrieval. 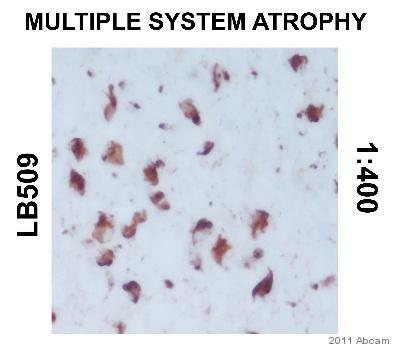 Immunohistochemistry (Formalin/PFA-fixed paraffin-embedded sections) - Anti-Alpha-synuclein antibody [LB 509] (ab27766)This image was taken from an abreview submitted by an anonymous reviewer. 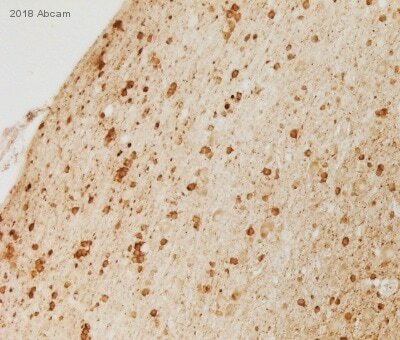 IHC-P image of Alpha Synuclein (ab27766) staining in human brain samples from patients with Multiple Systems Atrophy (MSA). The sections were subjected to heat-mediated antigen retrieval with citrate buffer. In addition, some slides received a 15 minute pre-treatment with Formic Acid. Sections were incubated in 20% serum for 30 minutes at +18°C to block non-specific protein-protein interactions. The sections were then incubated with ab27766 (1:400) for one hour at +18°C, followed by Biotin conjugated anti-mouse goat secondary antibody (1/200). 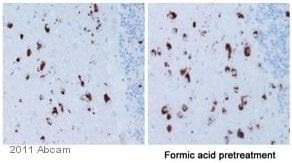 Formic acid pre-treatment (15min) revealed more inclusions in MSA tissue. 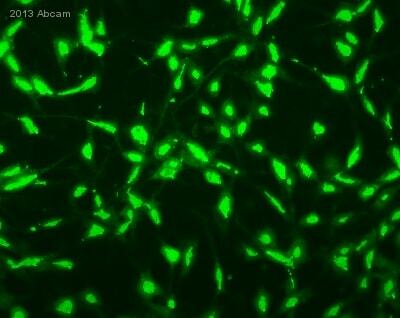 Human neuroblastoma cells stained for alpha-synuclein (green) using ab27766 in immunofluorescence. The neuroblastoma cells were fixed with paraformaldehyde and incubated with ab27766 (used at 5 μg/ml) for 12 hours at 4°C. A FITC conjugated Goat anti-Mouse IgG secondary antibody was then used. 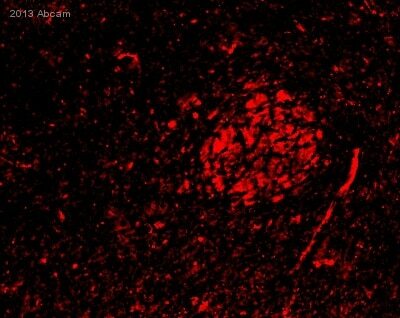 Overlay histogram showing PC12 (NGF differentiated) cells stained with ab27766 (red line). The cells were fixed with 4% formaldehyde (10 min) and then permeabilized with 0.1% PBS-Triton X-100 for 15 min. 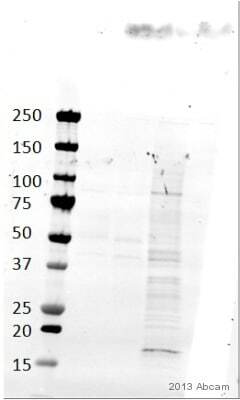 The cells were then incubated in 1x PBS / 10% normal goat serum to block non-specific protein-protein interactions followed by the antibody (ab27766, 1µg/1x106) for 30 min at 22°C. The secondary antibody used was Goat Anti-Mouse IgG H&L (Alexa Fluor® 488) preadsorbed (ab150117) at 1/2000 dilution for 30 min at 22°C. Isotype control antibody (black line) was Mouse IgG1 [15-6E10A7] (ab170190) used at the same concentration and conditions as the primary antibody. Unlabelled sample (blue line) was also used as a control. Acquisition of >5,000 events were collected using a 50mW Blue laser (488nm) and 530/30 bandpass filter. SH-SY5Y neuroblastoma cells stained for alpha-synuclein (green) using ab27766 in immunofluorescence. SH-SY5Y cells were fixed with paraformaldehyde, permeabilized with 0.5% Tween-20 and blocked with 10% serum for 1 hour at room temperature. Samples were incubated with ab27766 (diluted at 1/300) for 1 hour. 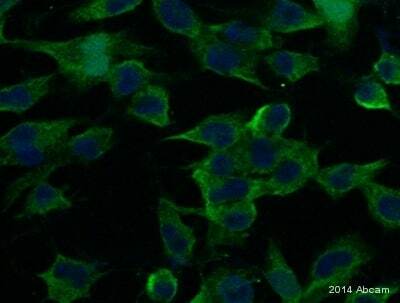 An Alexa Fluor® 488-conjugated Goat anti-mouse IgG polyclonal was used as the secondary antibody (diluted at 1/200). Publishing research using ab27766? Please let us know so that we can cite the reference in this datasheet.